The FPV (Financial Planning Volume) objective was 250,000 units per year over a 10 year cycle. From the projected FPV the profit margin goal was set. After all the financial & political mess had been sorted out we could now start the task we had been trained for, design engineering, safety, durability & meet FMVSS, (Federal Motor Vehicle Safety Standards) for certification and sign off by our legal office. Back in Dearborn we got to work with the HAD to get the clay model to a point of feasibility that satisfied styling & all BMDs, (Basic Manufacturing Divisions) as well as outside suppliers. Once the clay model is fully feasible we have reached the first mile stone. The model is then scanned electronically providing engineering with the vehicles outside shape. At clay approval you are telling top executives that you are an an 80% confidence level that can build the UN46 at a given production rate (84 per hour) by the Job #1 date, and that date is set in concrete. My task now was to ensure that we could meet both the timing and feasibility through to Job #1 i.e. Make sure that the vehicles structure will meet both safety & durability requirements. Design/Engineer into the UN46 all safety requirements i.e. restraints both passive & active. Meet 2 1/2 MPH bumper impact without damaging any sheetmetal skin. At 2 1/2 MPH the bumper deflected .75"
Mazda Corp. wants a two door sport vehicle restyled to Mazda's image. We met with Mazda management in LA & worked out how we could meet Mazda's wants without upsetting the UN46 program. 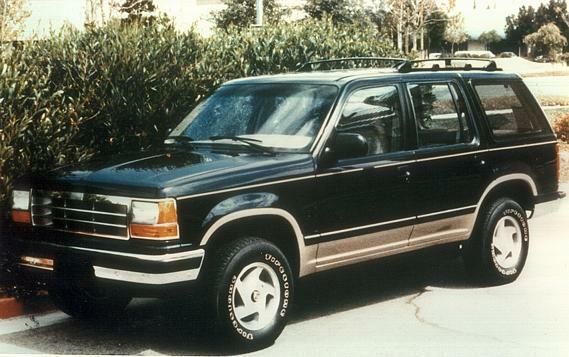 We made Job #1 for both the Explorer & the Mazda Navajo at a build rate of 84 units per hour, instead of meeting the objective FPV of 250,000 units per year we have built over 400,000 units since 1990. Prior to Job #1 I was told I had caner of the lung which put me out of action for 6 months. Add SLA front suspension (short arm - long arm) & delete the I beam front suspension. And so we start all over again, but this time we had to have all of the engineering done & go to Job #1 in less than 36 months from clay approval.